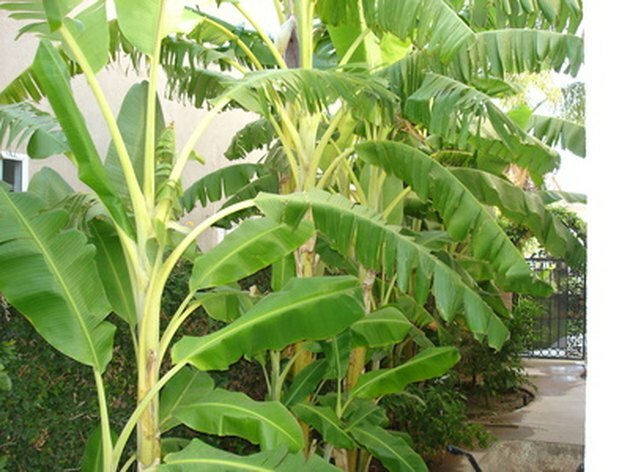 The banana tree is not a tree at all, but a herbaceous plant with pseudostems wrapped together to form a trunk-like structure. It blooms within a year of planting, producing fruit within two to three months of flowering. Bananas are tropical plants, susceptible to cold temperatures. There are many different varieties, some of which are inedible. Only one banana tree produces at one time on each matt. Banana rhizomes, or underground stems, grow suckers from many different points on the rhizome. Each rhizome produces many fibrous roots that intertwine to form a matt. Roots reach down 5 feet into soil and extend outward for up to 16 feet. Two different types of suckers or sprouts emerge from the matt. The sword suckers develop into producing psuedostems. Sword suckers have narrow leaves. Water suckers are weak psuedostems with broad leaves. They produce poorly. Most growers eliminate the water suckers, leaving sword suckers to grow into replacement pseudostems. Very small sprouts, less than a foot tall, are called peepers until they are identifiable as sword suckers or water suckers. Suckers grow into pseudostems, if they are allowed to remain on the matt. Most growers allow four to five pseudostems to develop on the matt, in addition to the main stem. Each pseudostem on a banana plant produces fruit only once. Once the main stem produces fruit, most gardeners cut it away and one of the remaining pseudostems produces the following year. The flowering stalk emerges from the pseudostem within approximately 10 to 15 months. The female flowers appear first in groups of 10 or 20 and do not require pollination in many varieties. These flowers produce bananas with each cluster of flowers producing a hand of bananas. The later flowers are male and drop away. Bananas are berries. Most of the edible varieties are formed without pollination, so the seeds are sterile and will not germinate.